Writer and reviewer Darren Slade, of the new (and highly-recommended...) blog Episode Nothing: Star Wars in the 1970s, contributes our first reader's list of the day. Our heroes have penetrated the enemy fortress, rescued the princess, got back to their spaceship and fought their way free. That would be a satisfying enough ending for most movies. In fact, when I saw the film at the age of 10, I thought that was the ending. It was a great ending, too. I just wished the whole thing could have gone on a little longer. In my excitement, I'd forgotten that the Rebels still had to deal with the small matter of blowing up the Death Star. What followed were 20 of the most exciting minutes of film ever. And however many times I see it, I'm still surprised when Han Solo flies out of the sun. 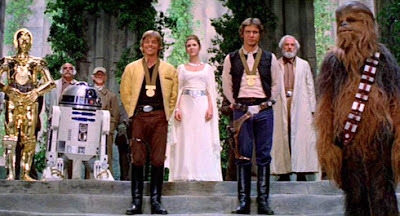 The medal ceremony, with its rousing music, caps the adventure perfectly. OK, so the original film has the brilliant twist ending, but everyone picks that one. The sequel has the end of the world as an ending. The director hated it. The star hated it. It wasn't the ending the screenwriter had wanted, but he was under orders to bring the franchise to a permanent end. It still astonishes me that a big, studio-backed film could end in so bleak a fashion. A chase scene which is the perfect synthesis of action, editing and music gives way to a farewell which is not exactly surprising but completely satisfying emotionally. And kudos to effects man Dennis Muren, who came up with the inspired idea of having E.T. 's spaceship leave a rainbow in its wake. It's an ending that shouldn't work, because it makes very little sense – yet does work, because it's dramatically right. Superman is faced with two nuclear missiles exploding simultaneously in two parts of the US. He's stopped one, but the fatalities caused by the other include Lois Lane. Distraught, Superman disobeys his birth father's number one rule and interferes with human history by turning back time. How does that resolve the problem when he still can't prevent two nuclear explosions at once? I still can't work it out, yet we're caught up with it because it's emotionally satisfying, and we cheerfully overlook the gaps in logic. Certainly the funniest ever ending to an SF movie. Luna: “You don't believe in science, and you also don't believe that political systems work, and you don't believe in God, huh? … So then, what do you believe in? What better homage to Flash Gordon than to end a $20 million movie with a cliffhanger? And we had to wait three years for it to be resolved. Audacious, yet the lack of an ending was a great ending in itself. "If thine eye offends thee ... pluck it out!" A chilling end to a movie which looks hokey and exploitative but is also brilliantly thought-out and almost profound. The Earth is doomed and only a fortunate band of young and attractive people get to escape in a rocket ship. We get only a glimpse of their new planet, Zyra, in a matte painting, but it looks an idyllic place to start procreating for the good of the species. In the closing moments, as the cast's autographs appeared among the constellations, it really did suddenly feel like I was saying goodbye to something that had loomed large in a lot of our lives. None of the cast should have come back in Generations. Darren has written-up a great list here, and I'm particularly happy to see The Undiscovered Country make the cut. That movie offers our final goodbye to the Original Cast (and still brings a tear to my eye). A wonderful choice. Darren- loved your choice of Superman and the reflections regarding it. I agree that is a rousing and unforgettable conclusion and it does work! Well said. A great list. I remember being shocked and chilled by the ending of The Man With The X-Ray Eyes the first time I saw it, late night on BBC2 in the '70s. Regarding Superman, it's odd that the turning-back-time ending was originally scripted for Superman II (which was being shot simultaneously) but moved to the first film quite late in the process. If I remember the DVD commentary correctly, the original film was going to end with a cliffhanger, in which Superman throws one of the nuclear missiles into space but the explosion releases the super-villains from the Phantom Zone.